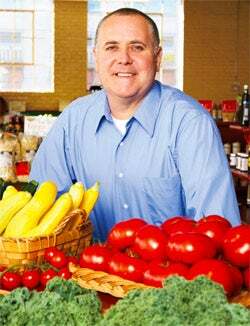 Robert Marshall of Marshall's Fenway Farm Stand uses geo-fencing technology to find customers and push deals to their smartphones. When Boston gets hit with a snowstorm, Robert Marshall's produce business, Marshall's Fenway Farm Stand, usually takes a hit in terms of traffic and sales. But during a January 2011 blizzard, he used the location-based marketing app Peekaboo Mobile to push out coupons to customers in the immediate area, offering 20 percent off to anyone who braved the elements and made a purchase between 4 p.m. and 8 p.m. Marshall claims the promotion helped pull in about 15 percent of his regular traffic on a night that would otherwise have seen almost no one. Location-based applications, in which businesses such as Marshall's send offers to people within a specific geographic area for a limited amount of time, are changing the marketing game. The roots are in a technology called geo-fencing, which erects a GPS-powered virtual "fence" around a particular location and automatically shoots out content to anyone who enters the space. This allows businesses to track customers' movement--the creepy part--and deliver promotions when those customers are most likely to act on them. You can credit (or blame) the upsurge in smartphones with built-in location software for driving the wider adoption of location-based apps. A September 2011 report from the Pew Research Center's Internet & American Life Project found that one-quarter of all U.S. adults use location-based services on their phones, and 55 percent of smartphone owners have accessed location-based recommendations from their phones. At the same time, geo-fencing and location-aware services raise significant privacy concerns. Now the government may get involved, with Sen. Charles E. Schumer (D-N.Y.) asking the Federal Trade Commission to look into the legality of the technology. At worst, tracking customers can create a PR nightmare. On Black Friday in 2011, two U.S. shopping malls owned by Cleveland-based Forest City Enterprises weathered heavy criticism for tracking shoppers through their cell phones and collecting information about their whereabouts. can help you employ location-based promotions successfully and avoid alienating customers along the way. Ensure explicit consent. No consumer should receive offers unless they have specifically authorized the platform or marketer to send them. Use apps from legit industry members. Joy Liuzzo, senior director of mobile research and client service at advertising research firm InsightExpress in Stamford, Conn., advises businesses to work with platforms and apps that are members of the Mobile Marketing Association (MMA), which has developed extensive industry guidelines. Don't abuse the technology. Michael Becker, MMA's managing director for North America, says it's a good idea to provide compelling content as well as offers. He cites the tactic of an outdoor-gear retailer who geo-fenced trail heads, offering the message, "Be sure to check out the cool waterfall a mile down the trail." As Becker points out, "If the call to action is always ‘buy, buy, buy,' that sounds like a 5-year-old saying, ‘Mom, Mom, Mom' all the time."